As previously reported, Seaglider 574 was deployed off Red Sands in the iSimangaliso Wetland Park on 15 March 2019. This glider moved very quickly with the Agulhas Current down to Durban. The glider pilots slowed its southward journey and kept it in the Durban Eddy for 17 days. The Durban Eddy is a semi-permanent clockwise circulation that occurs between Durban and Sezela, a small town to the south of Park Rynie. 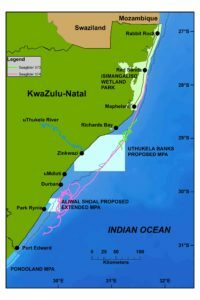 The eddy provides an important role in marine habitats of this part of the KZN coast, affecting water temperatures, dispersal of larvae and movement of fishes. The glider has been able to collect unique and important data during its time in the eddy. It is now on its way south towards its retrieval point off Port Elizabeth. On 30 March 2019, a second glider (573) was deployed just south of Cape St Lucia and the southern border of the iSimangaliso Wetland Park. This glider is moving southwards much more slowly than 574 did and has looped through some circulations off of Richards Bay. Currently it is off Mtunzini but will make its way to Durban by the 9th or 10th of April 2019. 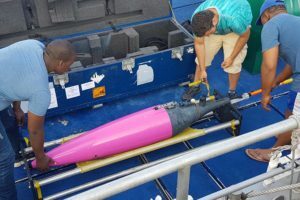 Once it is off Durban, it will be met by CAPTOR participants who will collect water samples at the same depths as the glider to calibrate the information that the glider has collected. This is standard practise to validate the data collected and ensure scientific credibility. After the water sample collection is completed this glider will continue southwards to its retrieval point off Port Elizabeth.